Focusing on the Index’s Learning theme, the average score for the under 25 age group (combining the 0–14 and 15–24 Age Group pillars) is 73, while for those above that age (combining the 25–54, 55–64 and 65 and Over Age Group pillars) it is 51. Particularly in developing countries, recent human capital investment in education has mostly been successful at improving the skills and capabilities of the younger generations – dramatically so in terms of enrolment in education, if not always as consistently in terms of education quality.16However, many education systems around the world continue to operate on an assumption of front-loading students’ learning in life, leaving older generations behind with the one-time educational attainment they achieved in their own youth, which contributes to global skills gaps and mismatches. The 22-point Learning score gap between younger and older generations highlights the effects of such front-loaded education systems across the globe. To balance the scales, a wider portfolio of lifelong learning opportunities, as well as flexible and modular learning approaches, is needed. Figure 8 illustrates these points. For countries like Japan (4) and the United States (24), the comparatively small Learning score gap between the under 25 and over 25 age groups points to previously already high educational attainment levels in the older generations. However, for countries such as Brazil (83) and South Africa (88) the small Learning score gap between the under 25 and over 25 age groups points rather to a lack of progress in improving educational attainment across generations. In yet other cases, large Learning score gaps point to especially large improvements across generations—notably in the cases of Yemen (129) (which moves from 12 in the over 25 age groups to 57 in the under 25 age groups), Iran, Islamic Rep. (85) (44 in the over 25 age groups to 80 in the under 25 age groups), Ethiopia (119) (18 to 53) and Iceland (20) (56 to 85). Policy-makers as well as business and civil society leaders everywhere will increasingly need to consider the preparedness of different age groups in the population for being re-skilled to meet the skills challenges presented by the Fourth Industrial Revolution. As Dorn and Autor note, “because occupations typically expand by hiring young workers and contract by curtailing such hiring … [in-demand] occupations will ‘get younger’ while shrinking occupations will ‘get old.’”17 Accordingly, well-qualified young people are uniquely positioned to meet the demand for newly emerging high quality job types in their country, whether at the vocational or tertiary level.18 Equipping older workers to do the same, however, will require a focus on continuous lifelong learning and skills upgrading. Among promising approaches, new digital learning platforms enable high-quality, low-cost learning content to be scaled through personalized, adaptive learning and blended learning technologies. 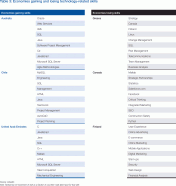 As highlighted in the World Economic Forum’s recent New Vision for Education Report, digital learning platforms increasingly cover the entire range of the life-course, ranging from children’s apps and gamified learning; through online university course learning; to self-paced, casual adult upskilling; to formal technology-enabled on-the-job training.19 To reach their full potential, these new technologies will need to avoid replicating the silos that often exist between different modes and levels of learning in their offline counterparts in traditional education systems. They will also need to develop new forms of widely recognized accreditation and certification, for example by linking courses completed on online learning platforms such as Lynda.com and Coursera to learners’ online professional profiles. Figure 9 groups countries ranked in the Human Capital Index into four quadrants. Those countries in the top right quadrant, such as China (71) and Iceland (20) started out from a solid learning capacity already present in their older generations, which has significantly improved even further for their next-generation workforce. Those countries in the bottom right quadrant—mostly mature economies such as Japan (4) and Switzerland (3)—had already reached a very high learning capacity in the past generation so that the improvements of the current youth cohort appear less dramatic. By contrast, economies falling within the top left quadrant have made very significant learning capacity gains in their young generation from a low base. It is in these economies—such as Bhutan (91), Tunisia (101), Ghana (84) or Turkey (73)—that the successful leveraging of the full human capital potential of the younger generations will be especially crucial to reaping the opportunities of the Fourth Industrial Revolution. Finally, countries in the bottom left quadrant, such as Nigeria (127), have so far failed to improve the human capital potential inherent in the learning capacity of their young people from their existing low base in the older generation—raising concerns about these countries’ future human capital trajectory. As today’s economies become ever more knowledge-based, technology-driven and globalized—and because we simply don’t know what the jobs of tomorrow will look like—there is a growing recognition that, in addition to increasing educational attainment, it also matters for countries to have at their disposal a diversified pool of different kinds of skills in their labour markets. For example, in the near future, most new jobs will have a technology component to them. This does not mean, however, that all young people everywhere should simply move into core science, technology and mathematics (STEM) fields or computer programming. As highlighted by the Forum’s New Vision for Education Report, among other recent research, what will increasingly be needed in the 21st century is good training in basic technology competence, asking the right questions, critical thinking, analysing concepts and leading a purposeful life—creativity, collaboration and non-cognitive skills.20 Knowledge of traditional arts and humanities subjects is highly relevant to this, obsoleting past notions of a dichotomy between humanities and sciences. The Human Capital Index takes this into account by compiling a unique skill diversity metric—a measure of the breadth of skills available in an economy or country—based on the degree of diversification of subjects studied in a country’s higher education system. However, different types of skills are acquired not just during formal education but, importantly, also through on-the-job learning. Data generated by digital talent platforms and professional networks presents novel opportunities to understand the existing skills pool of a country, complementing information about a country’s workforce with potentially more depth, nuance and timeliness than most publicly available international statistics currently can. For example, LinkedIn’s more than 430 million members record the skills they acquire and use during the course of their professional life on the platform. Currently there are more than 150,000 skills phrases that are self-reported by LinkedIn’s members, which the company has grouped into a dynamic taxonomy of 35,000 standardized skills using modern big data algorithms. 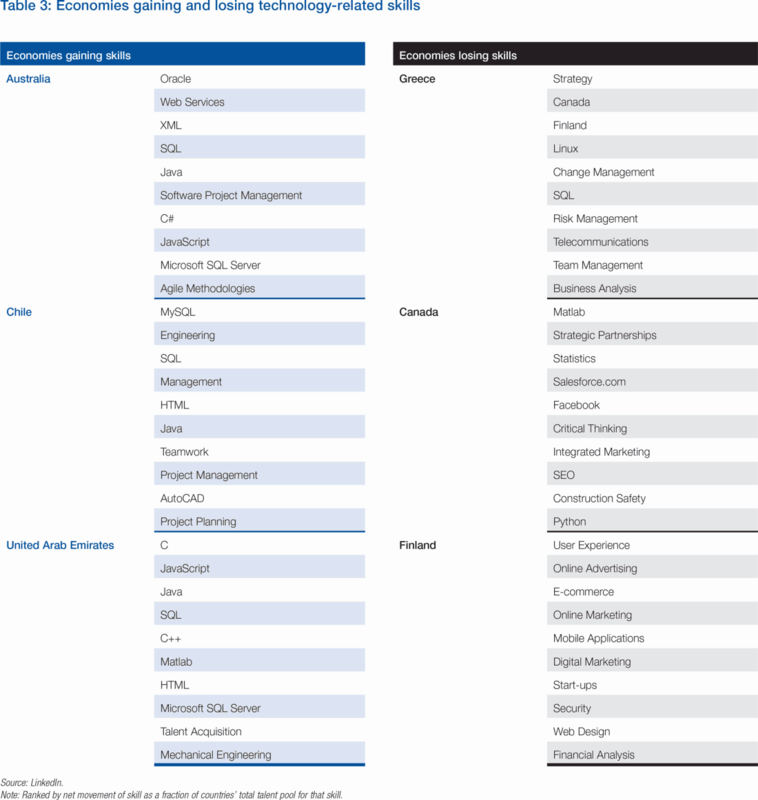 Using the composition of these skills across various countries as a base, LinkedIn has created a unique measurement of workplace skills diversity for this Report.21 We find that—based on LinkedIn’s membership profiles—countries such as France (17) and Switzerland (3) have access to a considerably more diversified skills pool in their workforce than Romania (38) or the United Kingdom (19). Despite its renowned education system, Finland (1), too, underperforms when it comes to workplace skills diversity, potentially affecting the country’s resilience in a rapidly changing jobs landscape. By contrast, economies such as Brazil (83) exhibit a comparatively high degree of workplace skills diversity. As presented in Figure 10, complementing the core indicator data of the Human Capital Index derived from conventional international statistics with the information generated by digital talent platforms also enables us to identify whether a larger share of the skills pool of any given country is acquired during formal education or on-the-job. While in countries such as the United States (24) the young population comes out of the formal education system with broad skills diversity, there is evidence of a much more concentrated set of skills used at work—implying generally narrow specialization in the workplace and, perhaps, fewer workplace learning opportunities. Portugal (41) does well in skills diversity in education and the workplace while Australia (18) performs comparatively poorly in both. Finally, in countries such as Colombia (64), while the education system imparts a relatively concentrated set of skills—more than half of all Colombian students graduate in business or a social science subject, while only 4% graduate in natural sciences—there is much greater skills diversity in the workplace, implying a higher level of learning on the job, as well as staff training and other human capital investment by companies. This data also helps illuminate the practical relevance of these aggregate country-level findings for business, policymakers and employees. Whereas employers and job seekers generally rely on formal education degrees and job titles to determine fit for a role—and national and international statistics agencies similarly capture a country’s human capital endowment in this way22 —the LinkedIn data reveals that understanding an economy’s human capital base at the actual skills level is crucial because formal qualifications alone are often insufficiently meaningful and job titles may imply very different skills requirements in different industries and geographies.23 Therefore, skills are a foundational block in formulating future workforce and human capital strategies. Figures 11(a) to (d) illustrate these points through the case of LinkedIn members with the job titles: (a) Care Manager, across the Hospitals & Healthcare and Non-profit industries; (b) Product Development Engineer, across the Automotive and Semiconductor industries; (c) Data Analyst, across the Market Research and Oil & Energy industries; and (d) Data Analyst, across the Financial Services and Consumer Retail industries. 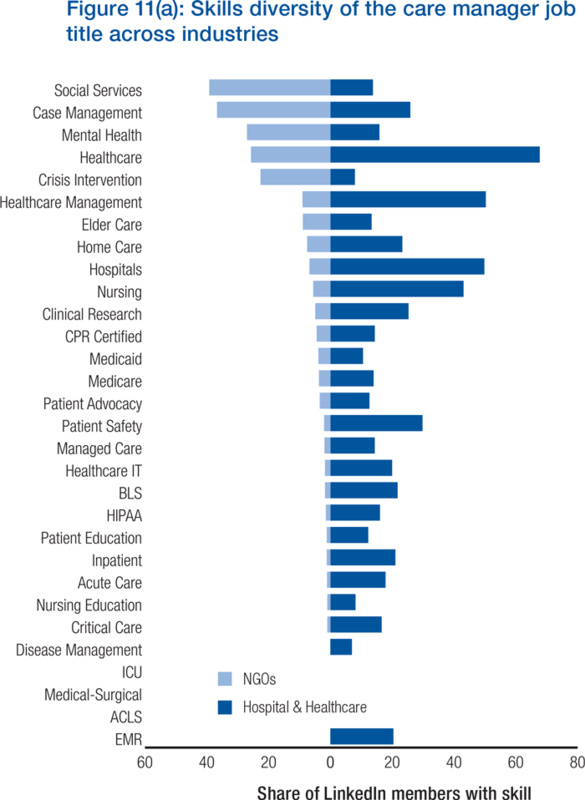 For example, whereas there is some overlap between the skillset of care managers across the two industries, the non-profit sector version of the role requires a much stronger skillset related to crisis intervention whereas the profile of the same role in the hospitals & healthcare industry is more focused on healthcare management. 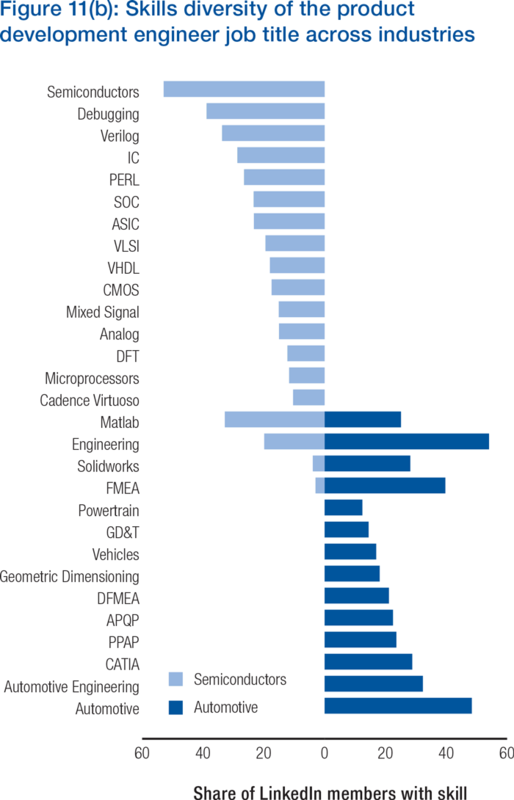 Similarly, the skills profile of product development engineers in the automotive and semiconductor industries differs greatly. The higher the skills overlap between two industries, the easier it is to transfer between them. 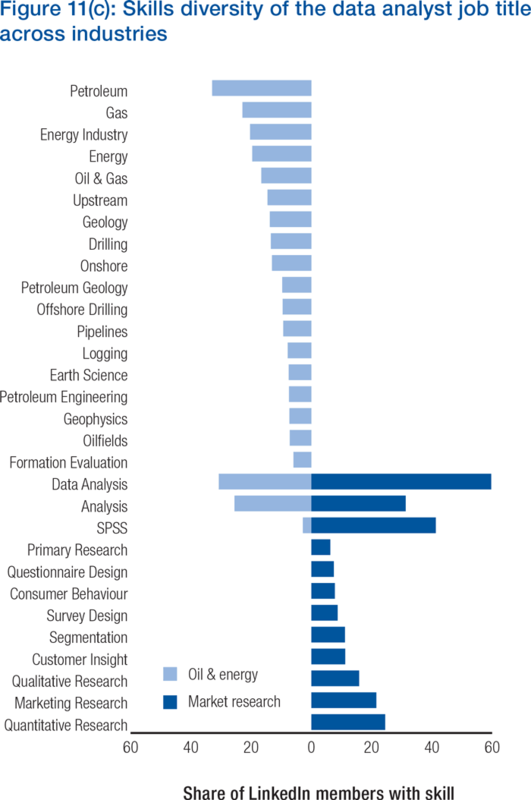 For example, there is little skills overlap between LinkedIn members with the job title “data analyst” in the market research and oil & energy industries. By contrast, data analysts in the financial services and consumer retail industries exhibit very similar skills. Practically, this degree of detailed skills information can help business, policymakers and employees in two distinct ways. First, it reduces skills gaps by helping employers—and employees—understand better how far they can cast their net when job searching and recruiting and which set of skills may be most transferable across industry boundaries. For example, an employer in the financial services industry facing a gap in data analyst roles can reasonably expect to consider applicants from the consumer and retail industry given the overlapping skillsets despite the different industries, as per Figure 11 (d), increasing the size of the firm’s potential talent pool and likely reducing time-to-hire. Second, more specific assessments of the level of skills transferability between selected industries and selected professions could be used to inform reskilling and upskilling strategies or even facilitate the wholesale retraining and redeployment of workers from one job function or industry to another based on skills-adjacency in industries disrupted by the Fourth Industrial Revolution.24 In the long term, countries can build resilience to labour market disruptions and changing job requirements by amplifying the diversity of their national skills base. Table 2 specifies the level of skills transferability for current job titles and roles across different industries (see Table 2). 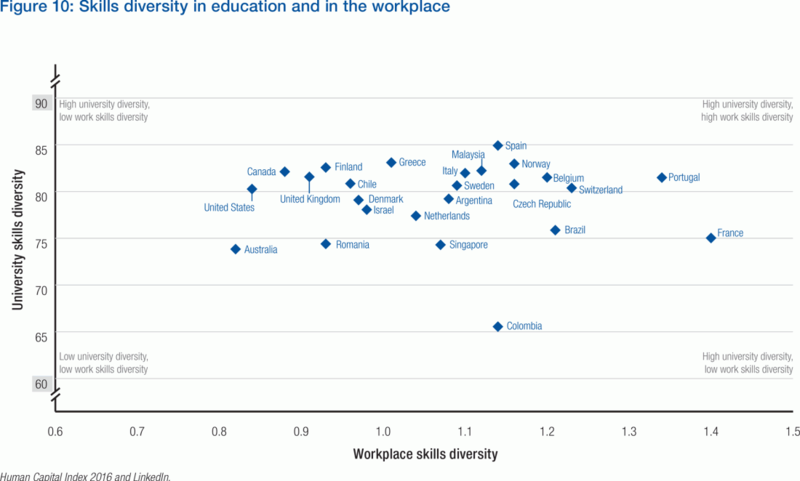 The degree of skills diversity varies country-by-country. However, just because a country has an abundance of a certain in-demand skill now, there is no guarantee that it will continue to do so indefinitely in the future. 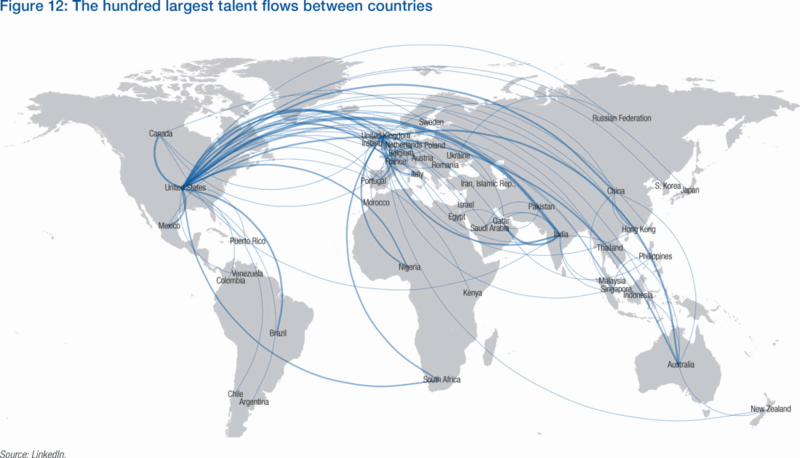 Data from LinkedIn’s Economic Graph25 makes it possible to visualize the inflow and outflow of human capital between countries—as workers with in-demand skills go where there is opportunity—to identify the specific skillsets countries are gaining and losing in the global marketplace for talent (Figure 12). A mapping of this kind of skills flows between countries is an opportunity for governments, businesses and employees alike to understand skills hotspots in near real-time. As the Fourth Industrial Revolution disrupts firms’ business models and economies’ development strategies, countries will require larger pools of particular groups of relevant skills to guarantee their long-term economic success. One set of skills that will be in high demand over coming years is related to science, technology, engineering and mathematics (STEM), and one measure of the future-readiness of industries and countries will be the breadth and depth of these skills within their overall skills pool. 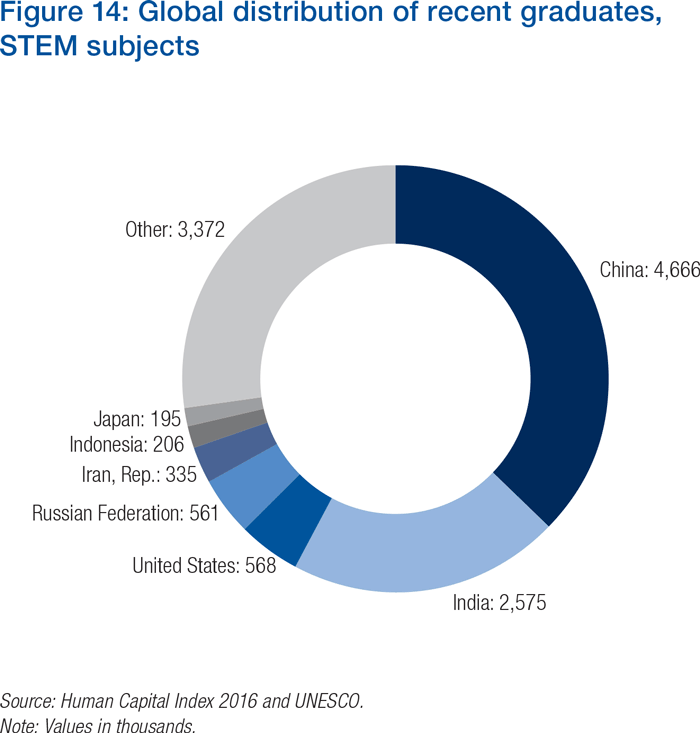 The Human Capital Index reveals that a significant share of the world’s total graduate pool in STEM subjects—combining the Engineering, Manufacturing, Construction and Natural Sciences fields of study, per UNESCO’s classification—is produced by a relatively small number of countries, not surprisingly those with larger populations (see Figures 13 and 14). 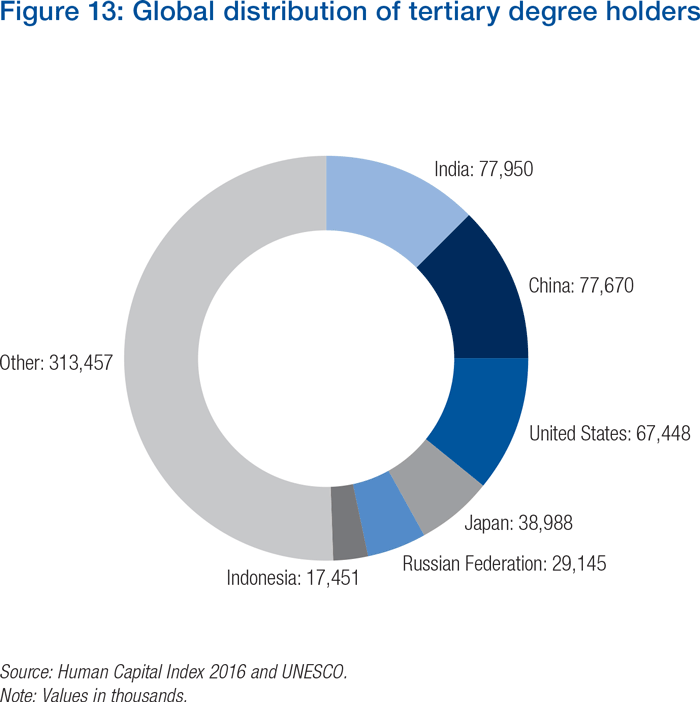 While proportionality to local population is also still an important factor in influencing demand, in a world with increasingly mobile talent, someone coming out of university with in-demand talent in any part of the world can become a potential recruit for anyone across the globe, giving rise to new global patterns of physical and digital talent mobility. To prepare talent for the Fourth Industrial Revolution, businesses must re-think their role as a consumer of ‘ready-made’ human capital and instead work with educators and governments to help education systems keep up with the needs of the labour market. Some companies understand this and are already investing in the continuous learning, re-skilling and up-skilling of their employees, but most employers still expect to obtain pre-trained talent from schools, universities and other companies. One important part of the solution is to look beyond formal qualifications, job titles and functions to reveal implicit skills and possibilities for re-skilling and up-skilling, especially in areas where there are global skills shortages and hence unmet demand. For example, globally, only about 84,000 of LinkedIn’s 430 million members have the job titles Data Analyst or Data Scientist, a highly in-demand job function for which employers and countries frequently report shortages.27 However, there currently are an additional 9.7 million LinkedIn members who have one or more of the primary skills or sub-skills to be qualified data analysts listed on their profiles, of which 600,000 have at least five of these skills or more (see Table 4).28 Clearly, while having one or even five related skills does not make one a data scientist, it is likely that a large percentage of this population—especially those who already have a significant bundle of related skills—could learn the additional skills necessary with a comparatively modest amount of supplemental training. 16 See Winthrop, 2015; Angrist et al., 2013; and Rissing et al., 2005. 17 See Dorn, D. and D. Autor, “This Job is Getting Old: Measuring Changes in Job Opportunities Using Occupational Age Structure”, NBER Working Paper 14652, 2009, and Infosys, Amplifying human potential: Education and skills for the fourth industrial revolution, 2016. 18 The issue is less about vocational training versus university education—but rather about reforming education systems in general to combine theoretical knowledge with practical application and lifelong learning by default; see Hanushek, E., Woessmann, L. and L. Zhang, “General Education, Vocational Education, and Labor-Market Outcomes over the Life-Cycle”, IZA DP No. 6083, 2011. 19 See World Economic Forum, New Vision for Education: Unlocking the Potential of Technology, 2015, and World Economic Forum, New Vision for Education: Fostering Social and Emotional Learning through Technology, 2016. 20 See World Economic Forum, New Vision for Education, op. 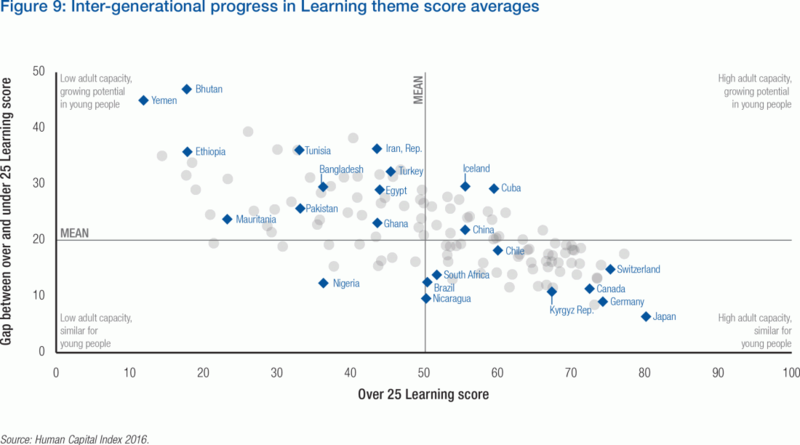 cit., and OECD, Universal Basic Skills: What Countries Stand to Gain, 2015. 21 To calculate skills diversity, LinkedIn applied the inverse methodology of the Herfindahl-Hirschman index for industry concentration; thus, the higher the number, the more diverse the composition of the skills. The ratio is the number of LinkedIn members with a given skill divided by all LinkedIn members for that given country with any skill. 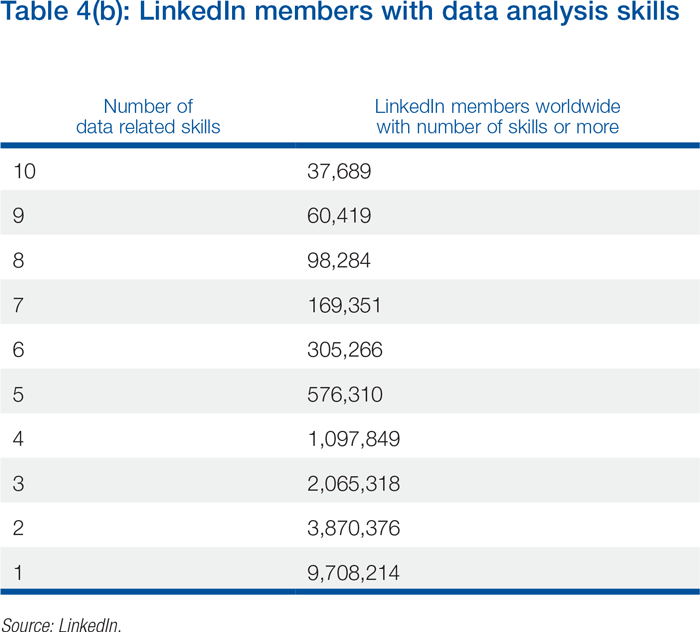 To ensure skill data is representative LinkedIn implemented three thresholds: the following thresholds: 10% to 50% membership coverage relative to the country’s population; countries with a population of more than 5 million. 22 See Boarini, R., M. Mira d’Ercole and G. Liu, “Approaches to Measuring the Stock of Human Capital: A Review of Country Practices”, OECD Statistics Working Papers, 2012/04, Organisation for Economic Co-operation and Development, 2012, http://dx.doi.org/10.1787/5k8zlm5bc3ns-en. 23 Clear differentiation between job titles and skills should be a foundational block in formulating future workforce and human capital strategies. 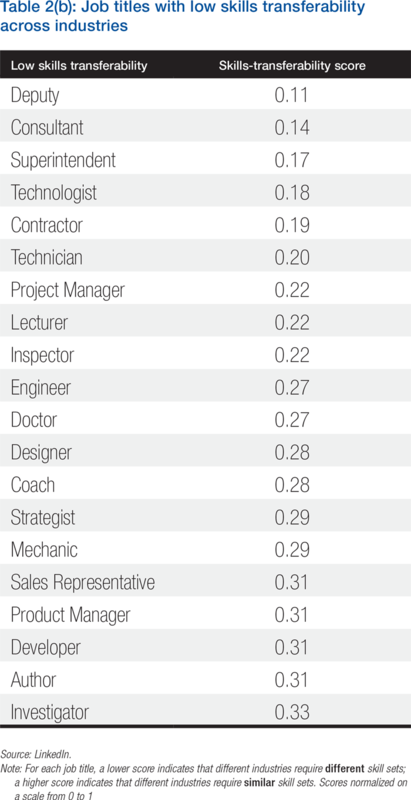 LinkedIn analysed the skills associated with every job title in every industry, using a variant of Term Frequency Inverse Document Frequency to identify the most “characteristic” skills for each title by finding the most common skills within an industry title pair and normalizing them by how frequently those skills appear in all industry titles. In order to protect members’ privacy, LinkedIn only used frequent and standardized skills in the study. Additionally, to ensure skills data is representative, LinkedIn implemented the following thresholds: 10% to 50% membership coverage relative to the country’s population; countries with a population of more than 5 million. 25 The vision of LinkedIn’s Economic Graph is to create “a digital map of the global economy that includes every member of the global workforce and their skills, all open jobs, all employers, and all education institutions”; see https://www.linkedin.com/company/linkedin-economic-graph. 26 Skills migration is an excellent way to model varying inflows and outflows of talent over time across geographies. The methodology is as follows: Timeline: March 2015–2016; skills only considered if added before migration and have moved at least 500 times globally; members who have been out of school for at least one year before move, to account for the fact that many students move to study, and then return home after school. 27 See Burning Glass Technologies, 2015. 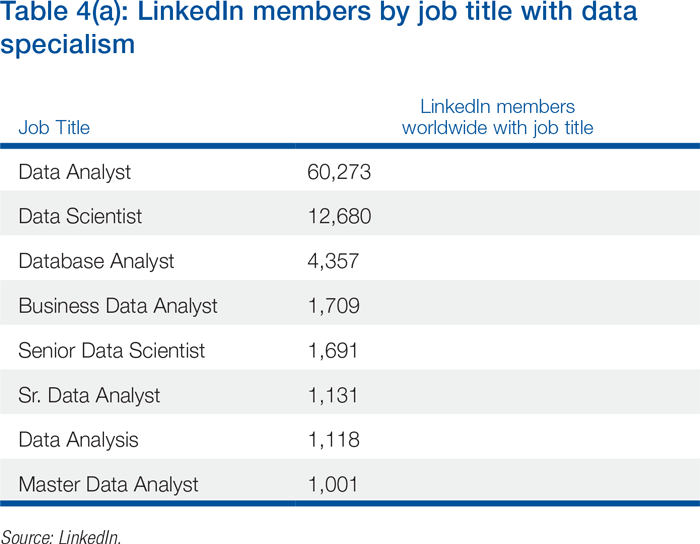 28 The investigation of how many potential Data Scientists there are on LinkedIn was driven by an analytics of their respective skills. 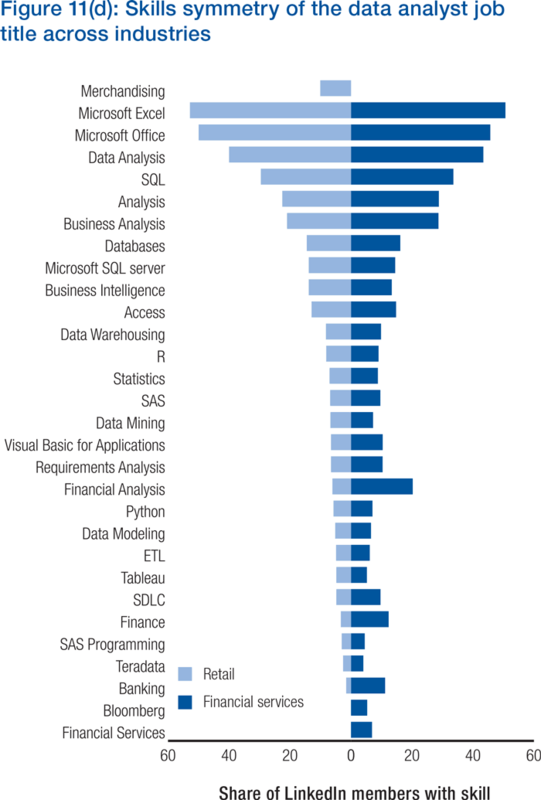 The primary skills associated with the titles Data Scientist and Data Analyst are: Statistical Analysis, Data Mining, Machine Learning, Mathematics, and Database Management & Software. As higher level skills taxonomy, LinkedIn used a clustering algorithm that brings similar skills together. 29 See UNCTAD, 2016; and Jeon, 2014.